Emma Zdgiebloski never realized research would become such a big part of her Drexel LeBow experience, but she has gone all in as both a STAR Scholar and a LeBow Undergraduate Research Fellow - a decision that has allowed her to get to know faculty and travel the world. She began her delve into research as part of the STAR Scholar program in the summer after her freshman year of college. She along with students across the University spent their first summer at Drexel working side by side with professors on active research projects with the goal of presenting their findings at the end of the 10-week summer term. Her research looked at college students’ knowledge and implementation of best practices in information security. Through extensive interviews, she found that college students know quite a bit about how to protect their personal information online but do not actively implement those practices. A hallmark of the program is the mentoring students receive from their faculty advisors. Working directly with faculty during her STAR Scholar experience encouraged her to apply to be a LeBow Undergraduate Research Fellow. The program connects her with additional faculty in the college to serve as a research assistant for the rest of her Drexel experience, completing 150 hours per term of faculty support and research in the fall and winter terms. Her time with the STAR program also allowed her to present her research findings at two different undergraduate research conferences, one in Asheville, N.C. and the inaugural World Congress of International Research in Doha, Qatar. Presenting internationally opened her eyes to the wide variety of undergraduate research around the world and allowed her to have a unique cultural expereince that would not have been available otherwise. Zdgiebloski completed her first co-op at Chubb, serving in IT Project Support. She is actively involved on campus as a member of her sorority, Delta Zeta, and the Honors Learning Community. 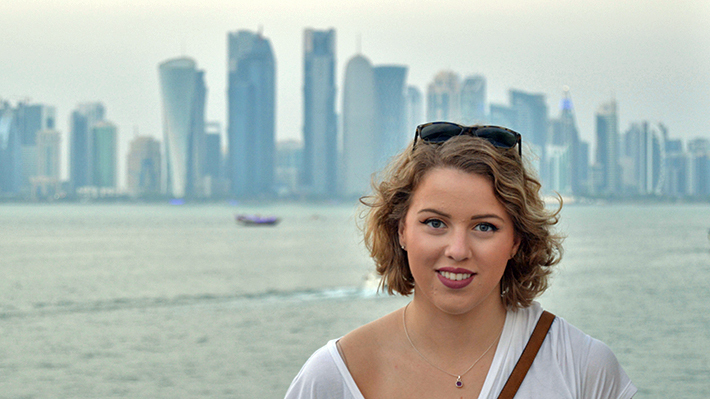 For prejunior business analytics and MIS major Emma Zdgiebloski, presenting her research in Qatar was a unique cultural experience. One she never could have dreamed of.